Licence in law (1956) and Dr. iuris (1965), University of Belgrade Faculty of Law. Honorary doctor, McGill University (Montreal) and University of Kent (Canterbury). Director of the Centre since 1995. Member of the Commission for Democracy trough Law (Venice Commission), Institut de Droit international, International Commission of Jurists, Permanent Court of Arbitration, Governing Board of the Association of Human Rights Institutes (AHRI) and the Serbian PEN Centre. 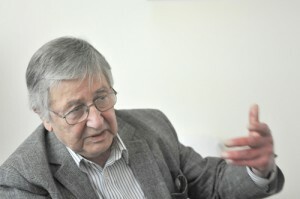 Professor of International Law and International Relations at the Faculty of Law in Belgrade until September 1998, when dismissed because of opposition to the new University Act of Serbia and protest against the dismissal of colleagues. Inter alia, was member, rapporteur and vice-chairman of the UN Human Rights Committee, vice-president of the International Studies Association, judge ad hoc of the International Court of Justice, Chairman of the Yugoslav Forum for Human Rights, President of the Yugoslav International Law Association, President of the European Movement in Serbia, Member of Presidency of the Civic Alliance of Serbia and member of the Serbian Anti-Corruption Council. Visiting professor at the universities of Split (Croatia), Sarajevo (Bosnia and Herzegovina), Virginia (US), Oslo (Norway) and Lund (Sweden). Lectured at many other universities. Published and co-authored numerous books and articles. Terorizam (Terrorism), Strahovlada (Reign of Terror), Silaženje s uma (Descent from Reason) and Međunarodno pravo ljudskih prava (International Human Rights Law) were published in several editions.